"Until The Light Takes Us" tells the story of black metal. 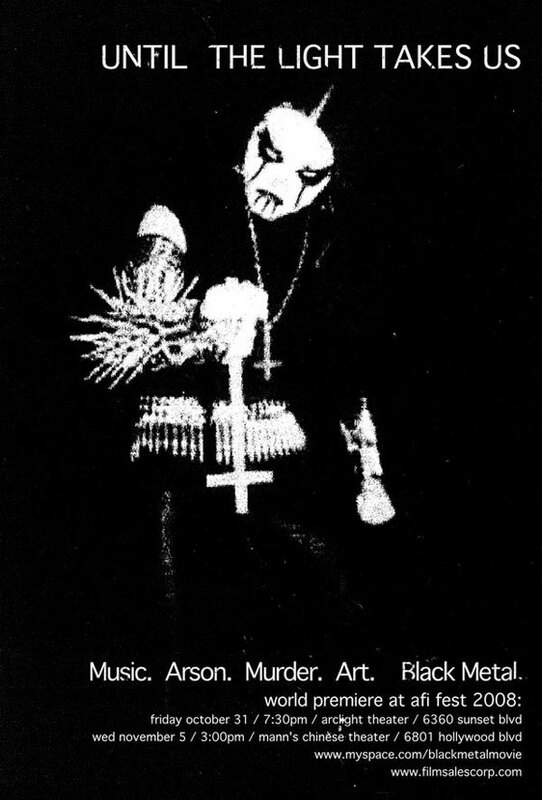 Part music scene and part cultural uprising, black metal rose to worldwide notoriety in the mid-nineties when a rash of suicides, murders, and church burnings accompanied the explosive artistic growth and output of a music scene that would forever redefine what heavy metal is and what it stands for to other musicians, artists and music fans world-wide. The film goes behind the highly sensationalized media reports of "Satanists running amok in Europe" to examine the complex and largely misunderstood principles and beliefs that led to this rebellion against both Christianity and modern culture. Read on to find out more about the screening dates of "Until The Light Takes Us" in the UK's Institute of Contemporary Arts (ICA). The film marks its debut at the Institute of Contemporary Arts (ICA), and coincides with the its UK DVD release via Field Pictures. The film’s DVD release will be on December 15, 2010 and includes four hours of extra features. More details on the film can be found at www.blackmetalmovie.com.